Types of fishes n the spots to try out on our shoreline. Rigging Your Baits for Surf fishing. 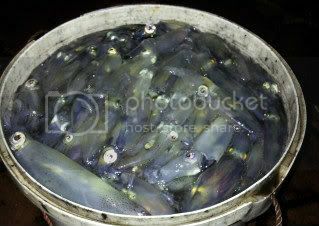 Photographs 10 with catch reports. 31 August 2004- Learn step by step on how to cast with a multiplyer at "Successful shore fishing"
21 February 2005-Methods n Baits Used to catch some common fishes here- See "Rigging Bait Page"
31 July 2005- Improved yourself to become a specialize surf angler- "Successful Shore Fishing" page. 06 August 2005-Method to stored your freshly jig Tamban in the best condition.-See Rigging your bait page. 23 August 2005-Correct angle to erect your rod holder and when to strike.-See it at "Successful shorefishing". 03 September 2005-A simple knot to join a hook line to the rig body.-See it at "Successful Shorefishing". 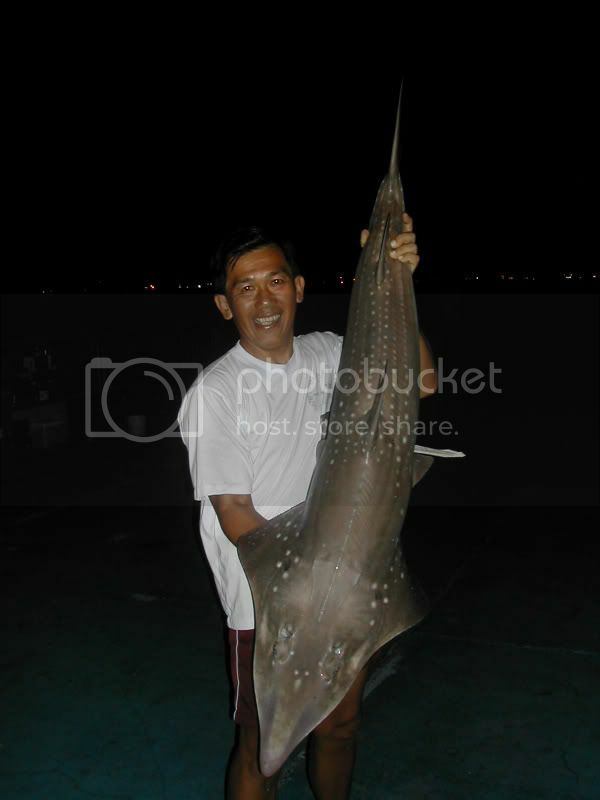 31 December 2005- 400lbs Bull Shark caught at a jetty in Florida U.S.A - See "Big Game Fishing page"
It all started on yesterday night 02-02-07 around 8.30pm. I was just back from work when I recieved a call from Budgeye, a member of fishingnewsroom. He was interested to join me on tonight fishing. I told him I hasn't decide where to go. I quickly took a bath n after this I gave him a call that I wanted to headed down to bedok jetty. The tide was coming up n the north east wind was blowing endlessly. Quickly set up my two rods n casted out. About twenty minute later budgeye joined me. He casted out a heavy tackle set n a lighter spinning one. It was his lighter set that perform well tonight. 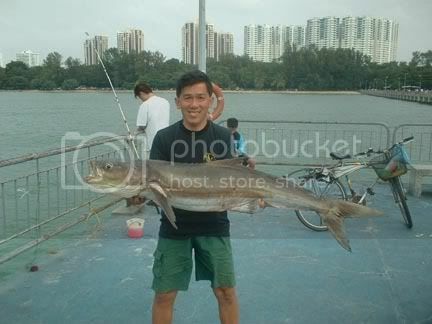 Within two hour n only four cast, he landed a 2kg conger eel, a white strip eel type catfish, a guramah n a small little marine catfish. Our heavy sets got nothing. It was quite cold after midnight n we decide to packup around 2am. He headed home while I went to take a rest on my multi purpose van. Wakeup around 7.30am n headed in to the jetty. The T-juntion front was quite occupied n only left the right side end have some space. Decide to take it as the tide is coming up. This morning the current is smooth but the sea is quite choppy as the surface wind is strong. After setting up, went to jig for tamban. Not even one caught after sometime. The old men(Ah Meng) who sell tamban jig was ready to go back n offer me his only one tua bak n five tamban he got it earlier. With this baits, I quickly went to cast it out. I was about to go n jig for more tamban when my Penn 500L Jigmaster reel alarm went off. Quickly turn back pickup the rod n strike. From far I saw a huge shadow jump up from the water surface n went down again. My mind was thinking I got a big queenie. The fish didn't do any more jumping again n the fight become tougher n stronger. After some tug of war, I manage to bring the fish closer but it still under water. It swim inward to my left side n entangle another fishing line. I told the owner to release his line n the fish wanted to headed straight under the jetty. But by this time my 40lbs leader already a few round turn in my spool n I quickly climb up the jetty railing n steer the fish out. By now it has already surface n all who present there can see it was a huge cobia. Upon seeing this, I get my self mentally prepare for a tough fight by keeping the line tight n short. The fish make a quick dash toward my right side by stripping some line out n headed again for the under of the jetty. I have to climb up the railing again to steer it out. With my 40lbs leader in the spool, I am very comfident of controlling it. But to my surprise, when I saw my hook was just about one centimetre hook inside the upper jaw of the fish, my heart is worried. It mean with any loosen of the line between me n the fish, with just a shake of the head, the hook can be easily come out. By now a malay uncle has bring along his rope gaff n try to gaff it for me. After a few try, he manage to just hook up alittle on the side of the fish. He try to pull it n the fresh tear. The fish make a dash n the rope gaff got entangle with my rig body. I started to shout for another gaff. A father n son team has it but take sometime to fixed up. Meanwhile I manage to bring the fish head above the water while it still struggling around. It take about five minute for the gaff to fixed up n within this time is really a torture n stressful for me due to the weak hookup. I have bring my own gaff but I can't hand the rod to someone else as any mistake mean the fish will be gone n I just don't like to take the risk. 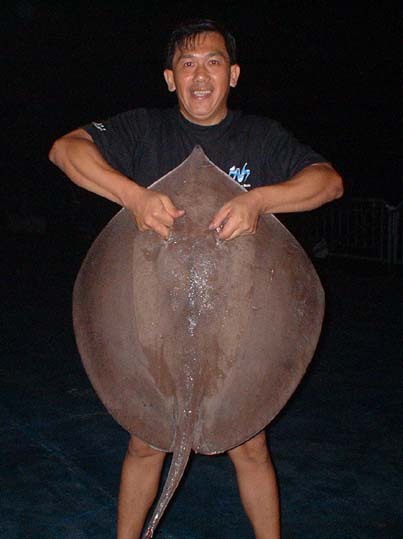 It took about 11 years for me to hookup such a big one after my team landed a 20kg one years back. The gaff finally ready n come along. A good gaff on the belly of the fish n it was pull up by two guys. Wow! finally I can relaxed. Many photos were taken n I thanks all who come n help. I took out my 22kg weigh but the fish was too heavy for it. Many present there guess it was above 30kg but to my experience, I will put it at 25kg. An hour later, I was on the floor cutting out the fish. I divide it into 9 pieces n pass it to those who help landing it. All are smiling n deep inside my heart I was so happy as I just broke my personal best record on cobia by surf fishing. Check out my new site for more details! 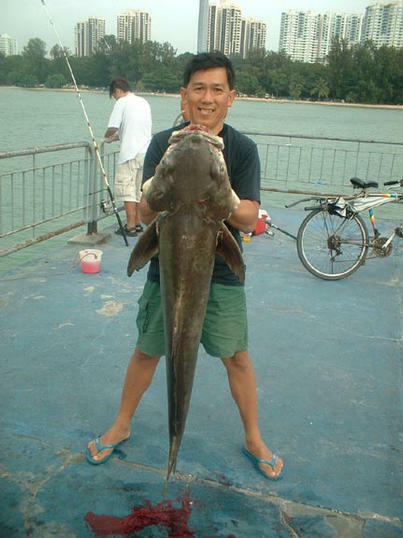 25kg Cobia landed this morning 03-02-2007 at bedok jetty. Just about ten minute later, suddenly my reel alarm went off. I pickup n strike. Hoho... this fellow is bigggrrrrr. It took my line n headed out straight to deeper water. It took me a few time to tighten up more drag to stop this fellow. When it finally stop, hooof....meters n meters of line has been strip. Without hesitating, I gave a few hard pump n it already at midwater. Very lucky was that by now the tide has passed it full n the current has die down. So this fellow can't use it weight n the current flow to prolong the fight. But it still manage to do some very strong tug of war with me. haha...I finally win the battle as this fish has no match on the powerful rod that I am holding. Ya...it proof that this rod still can take on bigger monster as it handle this fellow with ease. 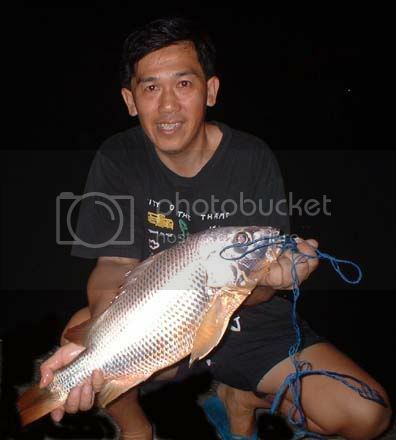 Nice 2.2kg Fingermark Snapper Caught. Date: 12-11-2005 Time: 2330hrs Rod: Loomis Franklin Big Game 12ft. Reel: Shimano Calcutta 400S Line: 20lbs mono. Rig: Long snood bottom feeder Hook: Long Shank size 4/0 Bait: Overnight fresh squid. It didn't rain in the afternoon n the tide was early full around 8.30pm. It also has a good smooth current flow after the tide turn down. Everything look very promising for a good night shorefishing. Armed with a box of overnight fresh squid, I meet Ron around 7.30pm at the beach. Each of us casted out two rod with long snood bottom feeder rig as after the tide turn, it has quite a good current flow. Around 10pm plus, a angler nearby landed a good size dog shark. It also show the feeding period has started. Without saying, all rods were change with new bait. Fifteen minute later, a small palm size fingermark snapper caught by another member of the group. Haha.. 2-0 down again. Sadly to say is by now all our bait casted out are very lasting n yet no fish bite. 11.30pm, suddenly I saw one of my rod the line gone loose. Hehe..strike n yes! got it. It struggle tremendously to dive downward. I know it quite sizable as I have to pump my rod hard to bring it up. It only after numerous up pump n down dive that I manage to surface it. Wow! it look big on water surface. After landed, I tied it in the water as it still early to packup. We try hard to level the score difference but was not successful. Haha.....it already 3am n with some lighting flash appear on the skyline, we call it off.